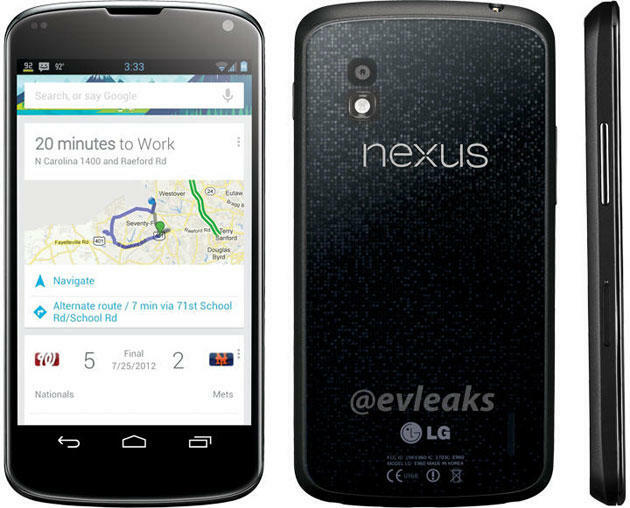 The ever reliable @evleaks, who has provided accurate specs/photos in the past, Tweeted out a picture of LG’s much rumored Nexus 4 on Wednesday. And you know what? It looks exactly like the many leaked pictures we’ve seen over the previous month. Worth noting: The press render includes a conspicuous third party battery gauge app, as noted by MoDaCo’s Paul O’Brien, though AndroidandMe contends it’s nothing more than a placeholder image inserted into the render. Despite its questionable authenticity, I’d say this pretty much seals what we’ll see during Google’s Oct. 29 event, when the company is expected to unveil the vanilla Android handset. Will there be others accompanying the Nexus 4? Plenty of murmurs suggested we would, but information regarding what/who/why has been scarce. That’s especially puzzling since the Nexus 4 has been all over the Internet, but maybe we’re in for a surprise come next Monday. Practically everything else about the event we already know.